Here’s how the whole setup works. The corselette layer is attached to the shell (lining) above the bust. 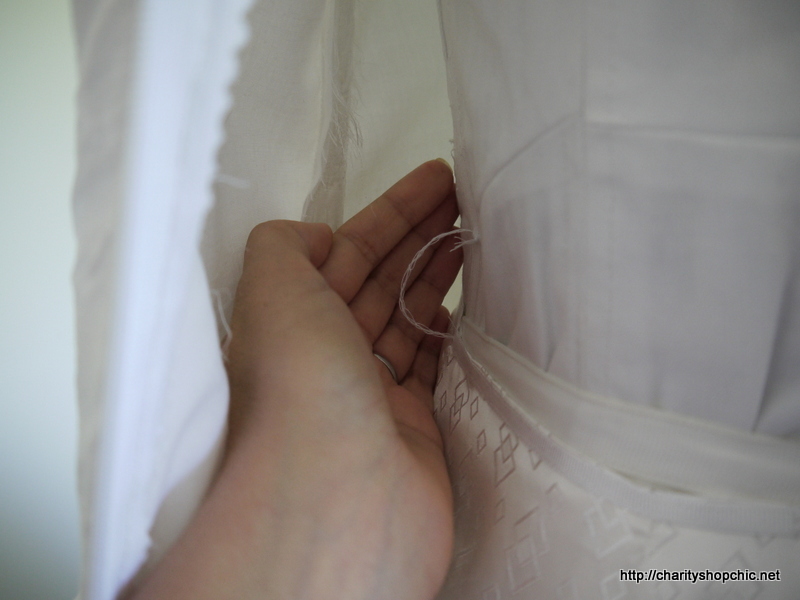 The skirt lining is attached to the shell at the hem only. 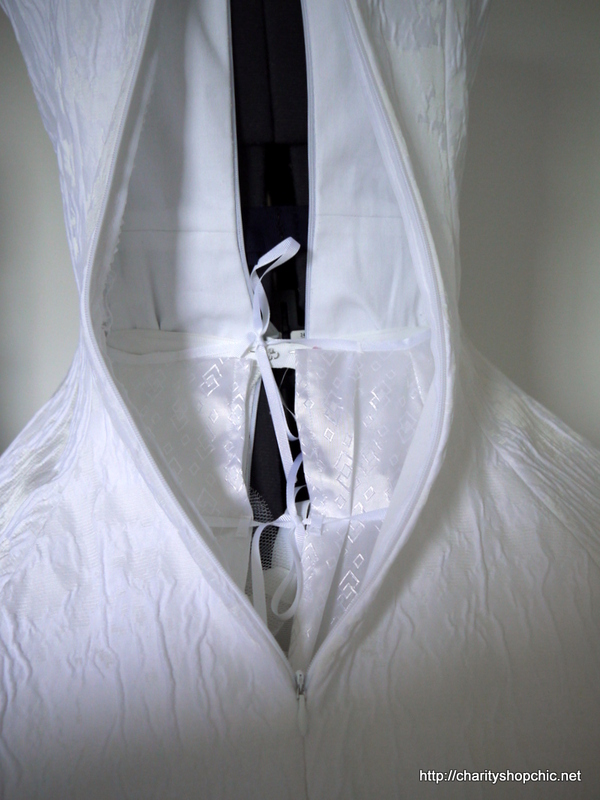 The waist of the skirt lining is free and goes between the corselette and the shell. The underskirt goes between the skirt lining and the corselette, and is separate/removable. Clear as mud? Good. Essentially the only tricky thing was getting the underskirt on once the dress was on, because it had to go between two layers. To help keep the skirt lining in the right place, I attached it to the corselette with some thread chains. I cheated and rather than hand sew some beautiful chains, I just chained off on the overlocker and cut it into 10cm lengths. Then for each piece, I threaded it into a medium sized needle (using a needle threader), took a small stitch through the corselette and the skirt lining, then tied knots in both ends. Maybe it’s more obvious below. These chains help keep the lining up inside the dress so I can get it on, but also leave the waist free because the underskirt waistband has to go under the lining waistband. Of course, it wasn’t as easy as that. With all the added weight of the skirt lining, which remember, I wasn’t originally going to have, the underskirt hoops I made from three rows of boning were buckling when I walked or sat down. 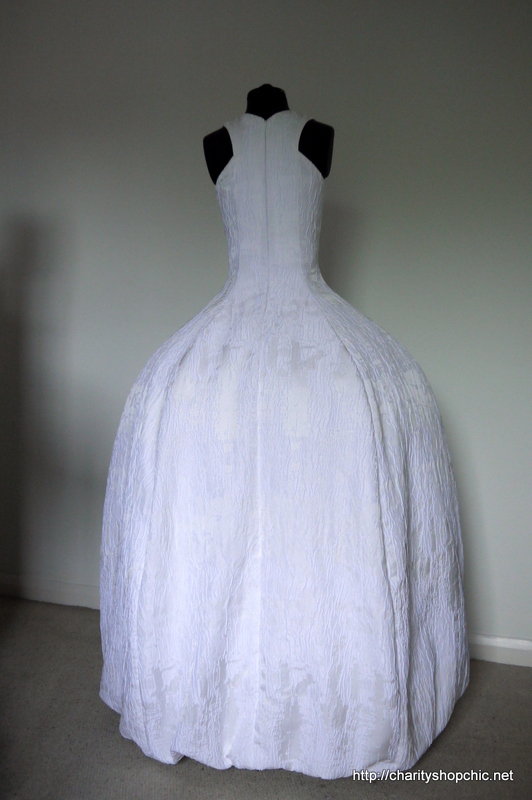 I must say I got a bit hacked off with it at this stage – partly because there wasn’t really enough space in my house to walk around in the dress to see whether it buckled only when I walked into something, or whether it would have done so of its own accord, and partly because I was facing a fairly serious problem which I wasn’t sure I could solve. 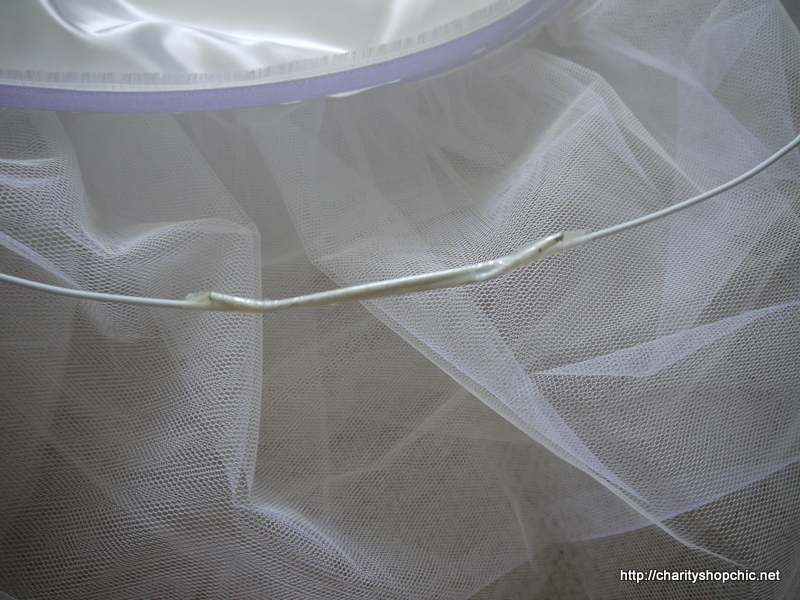 The idea of sewing on more boning filled me with dread, because wrestling that underskirt, which was completely covered in scratchy tulle, under the sewing machine was not a pleasant thought. Drastic measures were called for. I decided to make sure it was strong enough by adding a much less flexible hoop made of wire, that would definitely be strong enough to hold the dress up. It was an emergency. 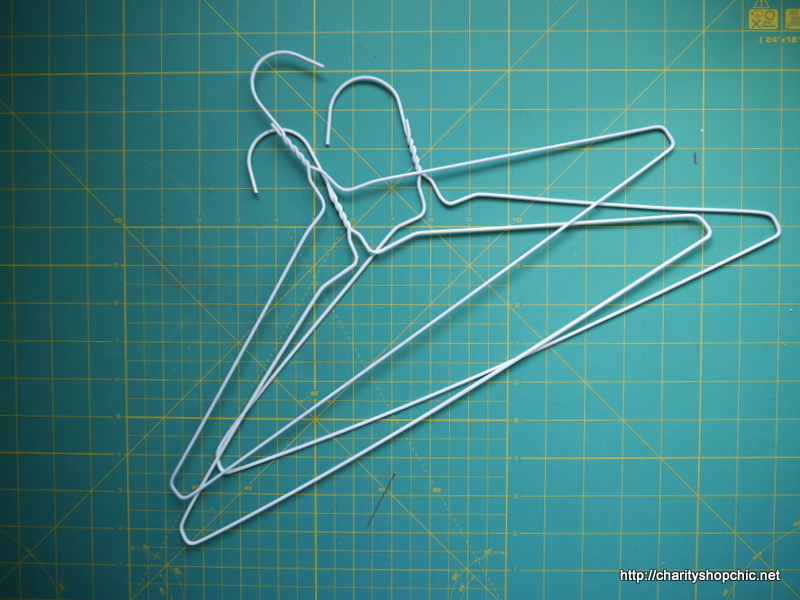 I ‘borrowed’ three wire coat hangers from Mr CSC’s wardrobe while he was out. 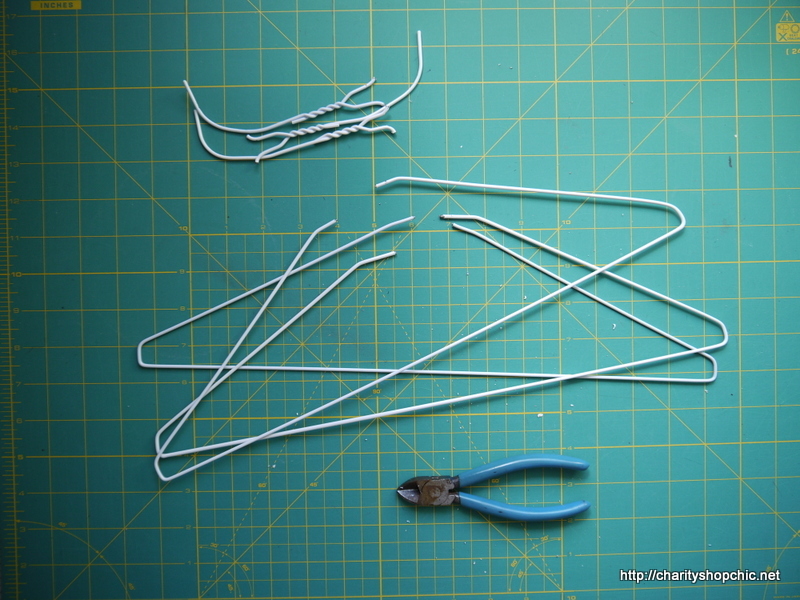 I cut off the hook ends with pliers. And I straightened them out a bit with my hands. Making a hoop the right size required sellotape, which worked a treat. 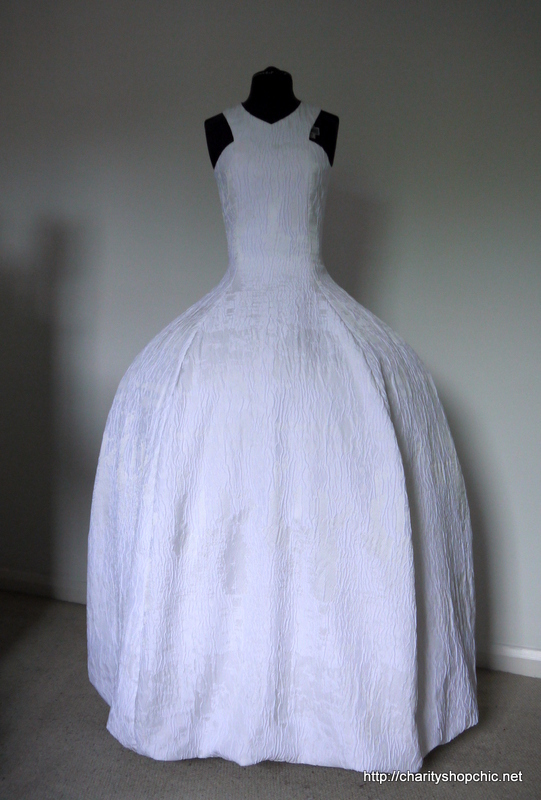 I actually covered the three sellotaped joins in white grosgrain because I couldn’t bear the thought of something that ugly being in the dress. 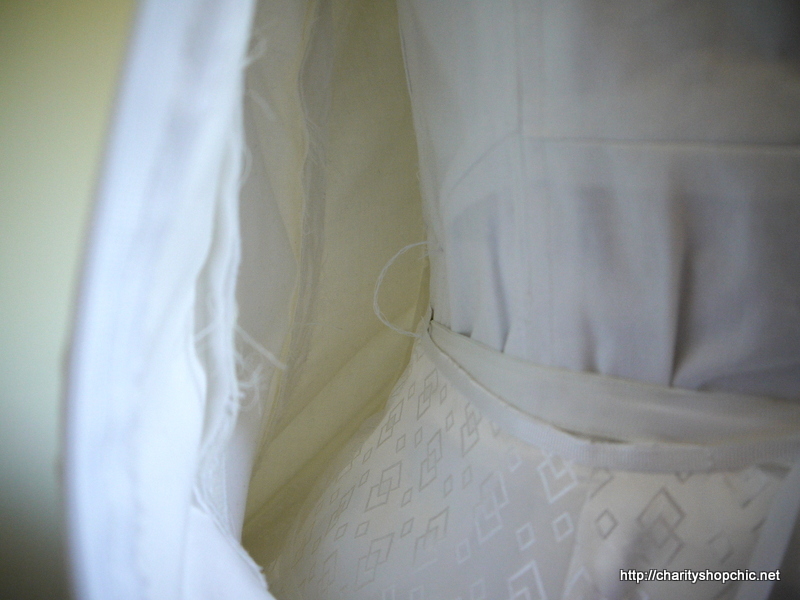 And finally, I hand stitched it to the inside of the underskirt, under the boning. It made a huge difference and I could breathe a big sigh of relief at this point. Disaster averted. 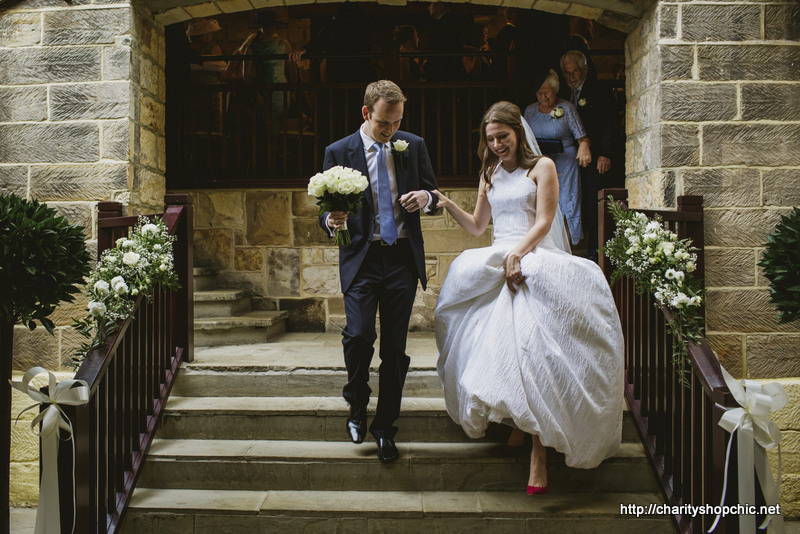 The only other changes I made in the days running up to the wedding were to add a few more tulle ruffles around the bottom of the underskirt where it was looking a bit thin, and shortening the skirt lining to take the dress up a bit, after I had a final walk around in my shoes. The last thing I wanted was to trip on a too-long dress when walking up the aisle, so I played it safe and made it a bit shorter. 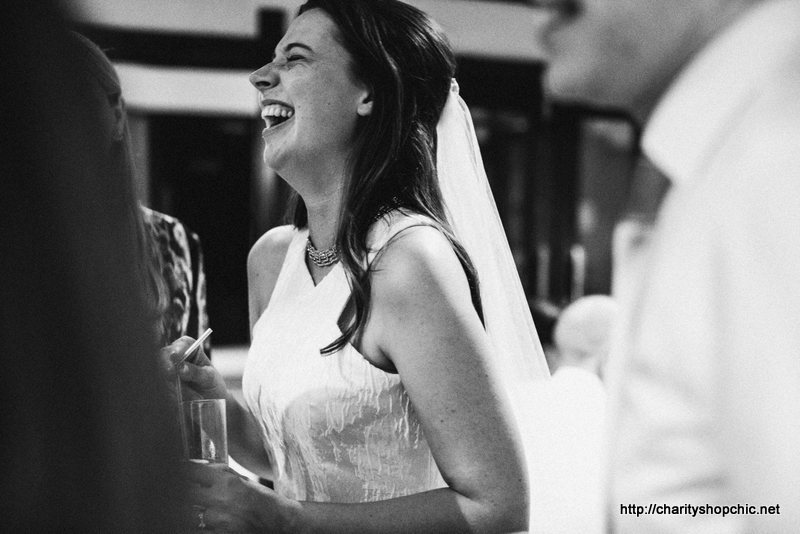 And now… the moment you’ve been waiting for… some wedding pictures! Thanks for sticking with me for this long, folks… normal refashioning service will be resumed shortly. You look absolutely gorgeous! Your dress is beautiful! Fantastic! Thank You for sharing with me your journey, its inspirational! Un. believable! What a beautiful bride you make, and your dress is totally stunning. I remind myself that I knocked out my first wedding dress one Wednesday night with some fabric pinched from my mother’s stash! Clearly little thought went into it – it didn’t look too bad though.. Thanks, Sue! I can’t believe you knocked a wedding dress out in one night!! That’s pretty unbelievable to me! Absolutely stunning, well done on such an amazing piece of art, which it truly is. And congratulations on your big day. PS I adore those red shoes – what a statement! They are actually fuchsia – my favourite shoes! What an amazing job you did – you look fabulous! Those red shoes are the perfect finishing touch peeping out from under your dress. Great photos of you both too – you look so happy. Congratulations! Beautiful bride, stunning dress, handsome new hubby. Hope you had a perfect day. Love the veil in the wind photo! Thanks, lynettesevin, I’m blushing! You are too kind. Congratulations Mr and Mrs CSC – long life, happiness and love to you both! Thank you Fabric Wrangler, you are too kind! :) The shoes are pink, though I guess they look red in the picture. We had a wonderful day and it’s such a great memory! Really impressive! What a fascinating, beautiful dress! Thank you very much – and thanks for reading! WOW!! Gorgeous in its simple beauty!! Congrats!! Thank you MJ, as always, for your support! 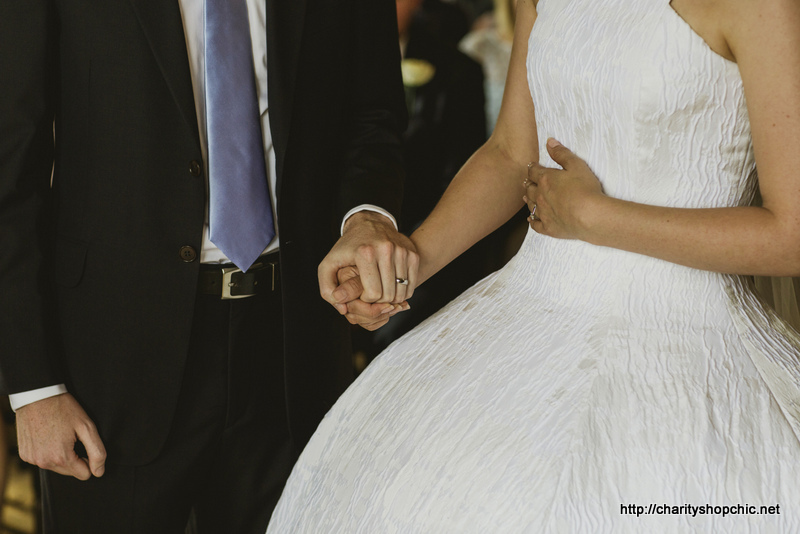 Absolutely beautiful – you and the dress! What an incredible achievement! Love the red shoes. I’ve so enjoyed following your story. Thank you for sharing it with us. Thanks JaneyB, I’m so glad you’ve enjoyed reading all about it, it was a bit of an epic! You are so clever! I always see things in charity shops I would love to re fashion but I cant sew. This dress is absolutely stunning! Thanks Charlotte, sewing isn’t as hard as it looks sometimes, maybe start with cutting jeans into shorts etc and go from there! Loved reading about the process but it was exciting to finally see the big reveal! I think both you and the dress look beautiful and I particularly like the cut of the armholes/neckline. Are you going to store it? You will need a whole closet for that skirt :) Congratulations on the wedding too! Hi Naomi, thanks for reading! I’m storing the underskirt separately, and it’s kind of collapsible. The whole thing is in a big box. Hopefully safe from dust for years to come! Oh be still my heart… The dress is breathtaking and you’re simply gorgeous! 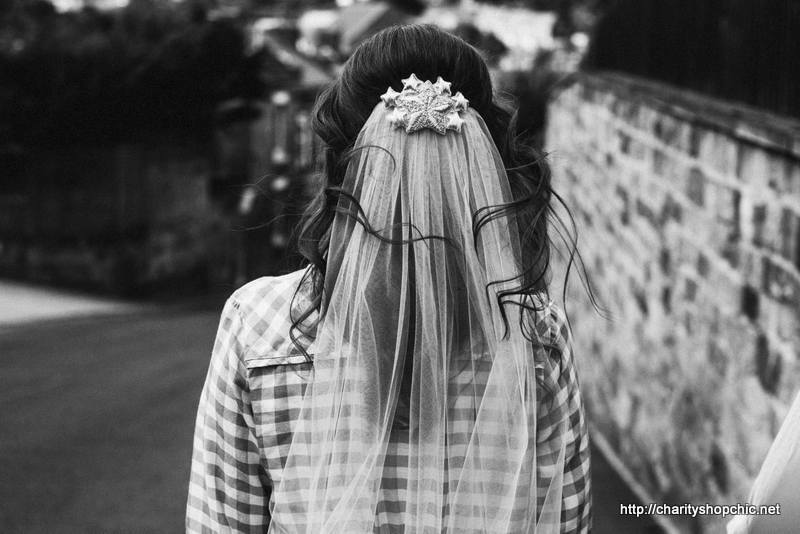 I love the way your veil looks in the breeze. Like a trail of stars is following you wherever you walk. You did an amazing job!! Beautiful bride & beautiful dress! Amazing achievement! I would love to make a wedding dress ☺. Great that you wore red shoes instead of the usual ivory! Thanks Jules, and thank you for reading! It’s incredible, a work of art!! You look absolutely radiant in the dress. Long time lurker but had to post on this. Simply beautiful, you are so talented and made a lovely bride. Have been dying to see the final result, it’s been like waiting to see who shot JR! Well done and lots of happiness in your marriage. Hi Gill and thanks for de-lurking! Thanks for your kind comment. I’m so glad you liked the dress! Thank you so much for your good wishes, Amy! Thank you so much, you are very kind! I’ve loved working on it. Thanks for your good wishes, Mrs H! And thank you for reading! Beautiful! It was worth all the hard work, truly unique and very you. Congratulations! Thanks, Ailsa – and thank you for reading! Amazing, beautiful and fascinating. Thank you for sharing all of it. You are welcome Donna, and thank you for reading! Wasn’t bored with any of it. Love the dress, veil, shoes everything. So worth all that work. Thanks Connie – I loved working on it! Thank you for reading. 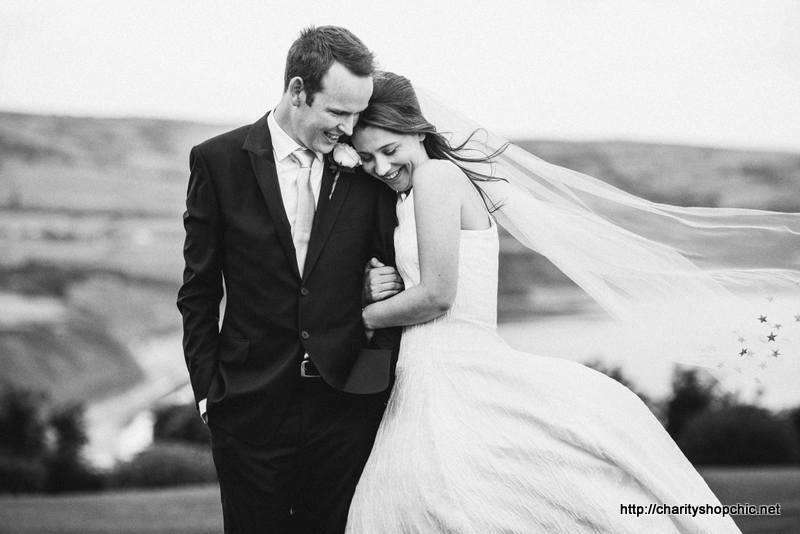 Thank you for sharing all your details with us and your beautiful wedding photos too. 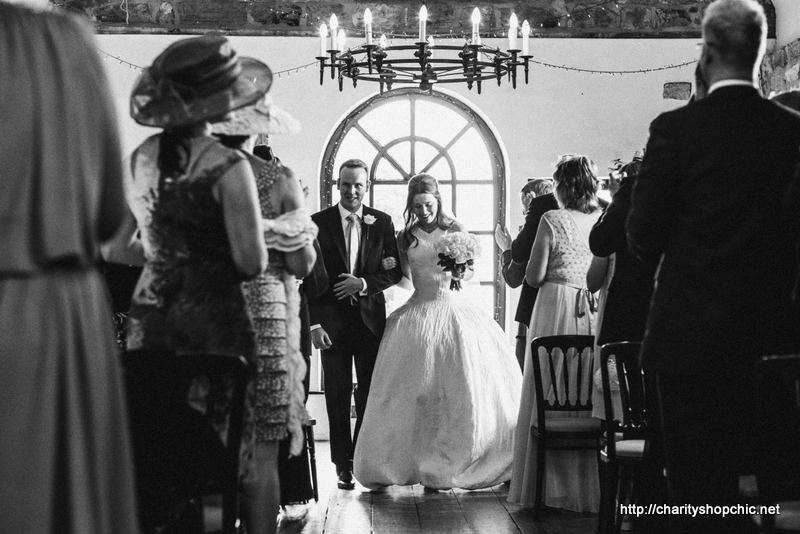 What a fabulous dress – no one else has a wedding dress like yours! How cool. Many best wishes on a great, happy marriage. You are welcome, Claire, and thanks for your good wishes! Officially? I choked and had to hide tears. Happy trails to you both. Congratulations to you and your husband. Absolutely breathtaking work, from start to finish. I made my own dress and remember the sheer extent of the work involved, including trying to fit yourself and manipulate underskirts and dress layers. Thanks for sharing so much of the planning and making. It’s really stunning – you did a fantastic job! It’s one of the smaller details, but I particularly love the way the stars on your veil stand out in the photos where it’s blowing in the breeze. Congratulations to you and Mr CSC! Officially? I choked and had to hide tears I am moved. Happy trails to you both. Absolutely incredible! !….and so worth the wait! Congratulations!! Incredibly lovely. Your smiles are infectious! Thanks for sharing the whole process with us. What a treat! Wow! The dress is beautiful and unique, you look,fabulous. 14/12/2015 - 10:36 pm Tami C.
Absolutely beautiful!! Thanks for sharing! Thanks Margo, you are very kind! Thank you so much Michele for your kind comment and good wishes. We had a wonderful day and it is a lovely memory! Thanks for your support, Michele! You are truly talented! Great to see you make something from scratch, especially something this important. Best of luck to you, your business and your marriage, and by the way, it was lovely to have met you! 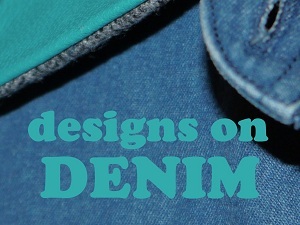 Looking forward to the next refashion. Thank you, Miss J! I do enjoy making things from scratch, it’s a different ball game though… Thanks for all the good wishes! The dress is as beautiful as you are. Congratulations! Wow. Wow. Wow. Wow. The dress is gorgeous and suits you wonderfully. I LOVE how the stars show up in the veil. 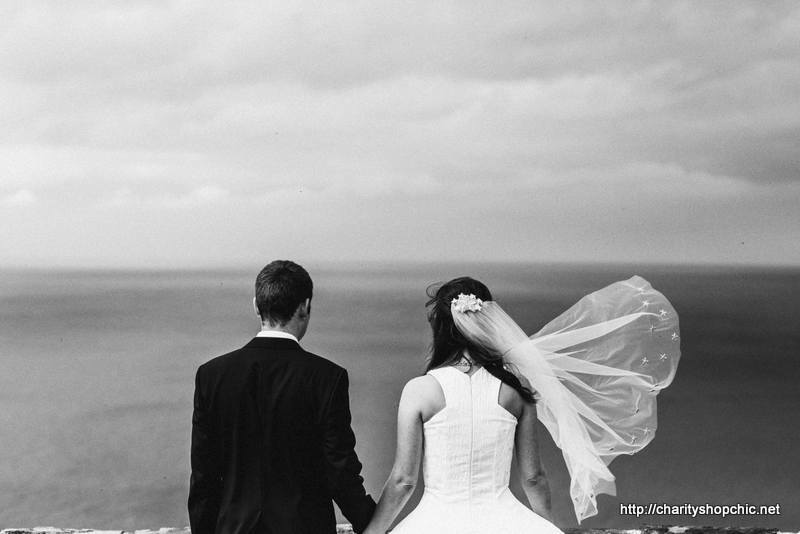 Um a wedding photographer, and these pictures are just beautiful. Well done. Thank you so much, suzibrooke! 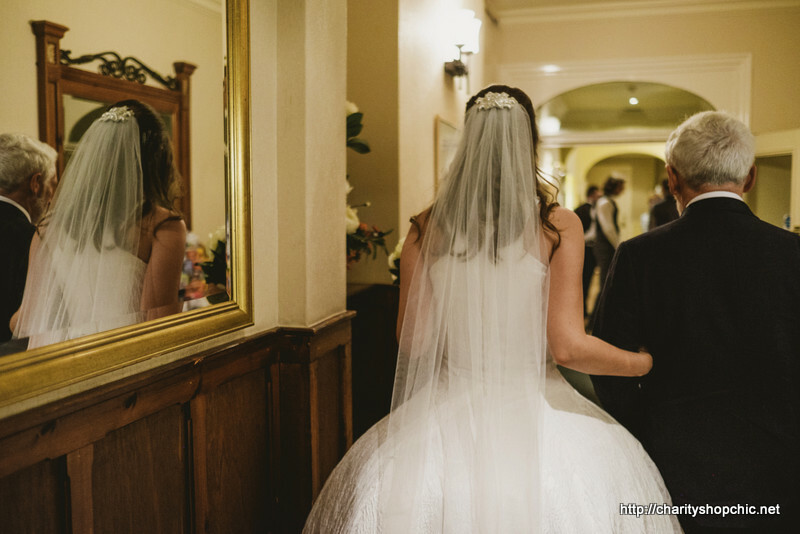 I was so pleased with the veil and the photographers did a great job of capturing it all as well. Such lovely memories! Maximum, maximum respect on the whole thing. (And you looked stunning in it which is the whole point!) I imagine this must have been an immensely satisfying process. Thank you, Naomi! You are very kind. It was a lot of work but yes, very satisfying and I loved wearing the dress on the day! Thanks so much for your support Gema, it’s been a long process but I’m so happy with what I’ve achieved and I loved wearing the dress on the day! I’m so glad you’ve enjoyed reading about it. You look very good in your dress and it’s a major achievement to put it all together. My favourite part is the veil, it’s an heirloom type piece that could be used with many other dresses. The shape of the shoulders works well and is very original looking. The skirt was a lot of effort and seemed to need modification after modification. What happened when you sat down or needed the loo? I read that Lily James as Cinderella, had to use a potty. From your experience would you change anything if starting again? Thanks for the many excellent posts sharing this labour of love. Thank you so much, Helen! Haha, no potty required, thankfully the underskirt remained relatively collapsible between the hoops, so I managed toilet breaks without too much difficulty. To sit, I just lifted the wire hoop a little before perching on my chair and it was absolutely fine. Possibly the only thing I would change would have been to buy a hoop skirt and modify it rather than starting from scratch, as the stiff netting I used scratched my hands a lot and was a bit of a pain to sew on my ordinary-sized machine. Still, I was really happy with the dress and loved wearing it! Such a beautiful dress! Congratulations on the dress, the marriage and the handsome husband. I have to ask, how old were you when you learned to sew? Did you ever imagine it would lead to this??? Thank you so much for your good wishes! I’ve sewn on and off since I was a child but took it up as a hobby when I wanted to make my own dresses at university. 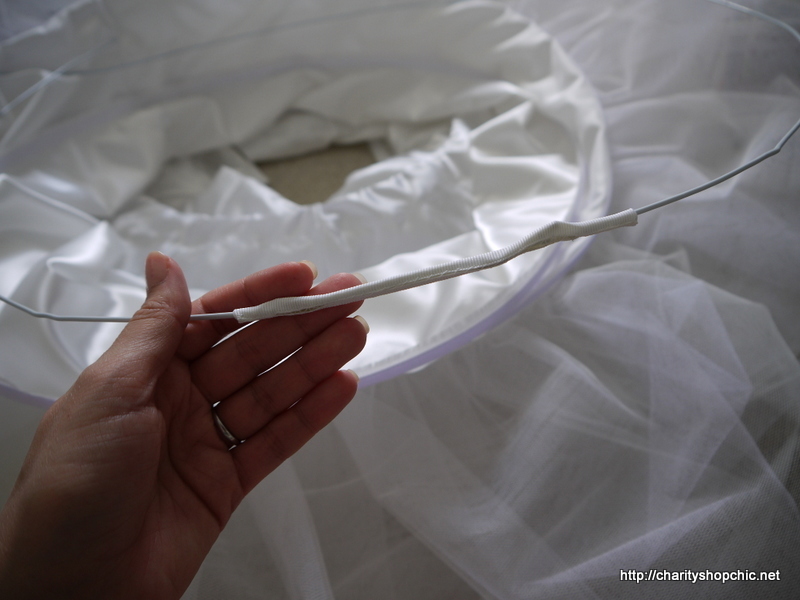 I definitely didn’t imagine that I would progress to making my own wedding dress! 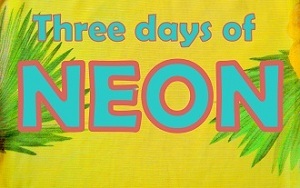 HAHA I love it! You’ll have to teach her to sew! 15/12/2015 - 1:59 pm Linda of Nice dress! Thanks, I made it!! I loved reading the whole series. Then to see the end, what a beautiful dress for a beautiful day! Congratulations! Thanks so much for following along, Linda! And thanks for the good wishes. Stunning!! Thank you for sharing your beautiful photos with us! Thanks Melissa and thank you for reading! Thank you so much! And thanks for the good wishes, we had a wonderful day! This was awesome! I love how you made the dress versatile so you could go from the wedding to the ceremony, dance, sit, hug and all that with the same dress while wearing something that is so uniquely you! Hi Caty, thanks for commenting! Yes, the dress was designed to be as practical as possible and still be dramatic! It was a lot of work but I loved wearing it; definitely worth it! 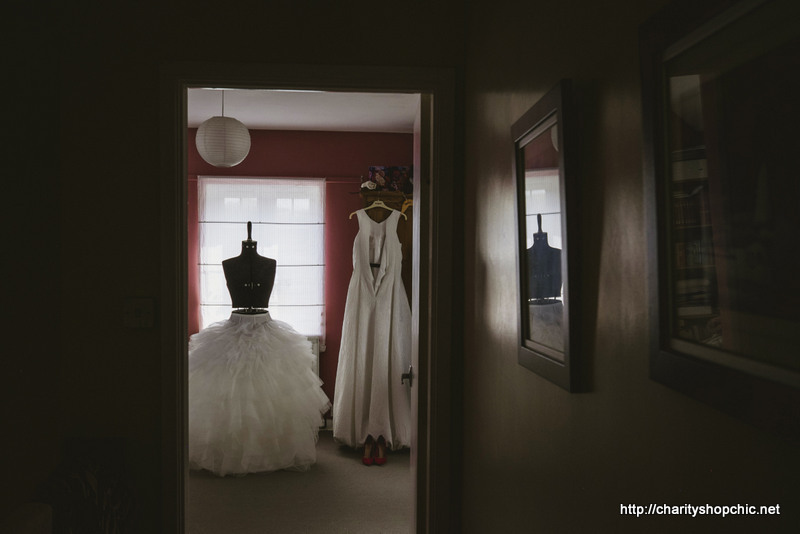 That you made your own wedding dress will stay with you as one of the wonderful memories you have of this very special time. Many congrats on a triumph of a creation and wishing you many more happy moments in the years ahead! 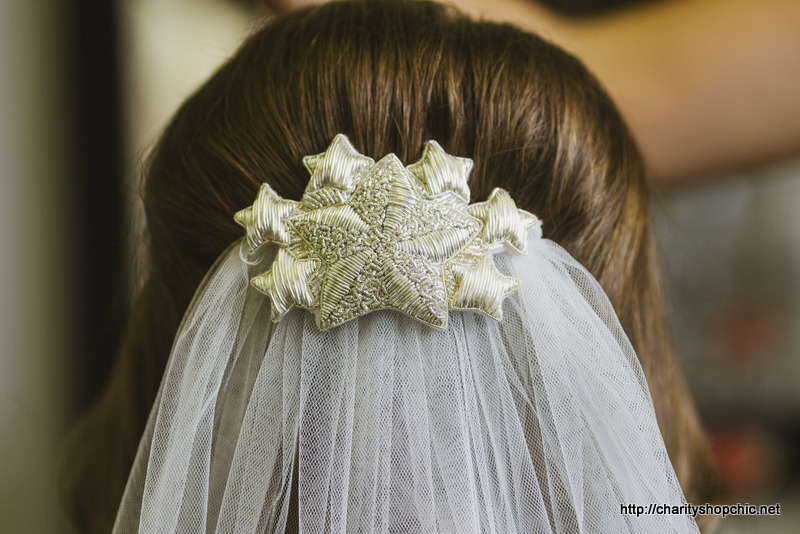 Absolutely stunning, I love all the details like the stars on your veil & the amazing comb. Thank you so much Charlotte! The comb was a lot of work but I was determined to do it! Congratulations, the effort was well worth it you looked amazing. Just one question how did you keep the design secret from your husband to be? Hi Bertied, thank you for your good wishes! I’m lucky enough to have a spare room in my home which I use as a sewing room. I made that room out of bounds for my husband for several months before the wedding, with the door closed. It must have been difficult for him not to peek inside! Just beautiful! 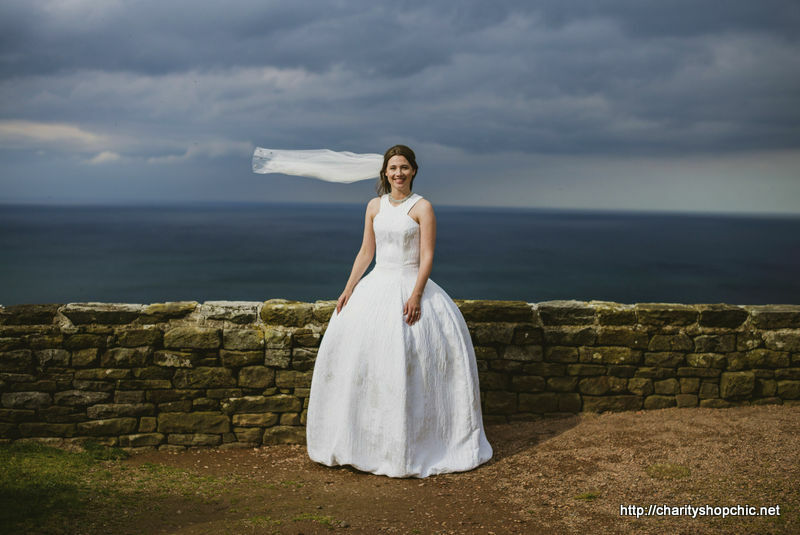 Thank you for sharing some of your wedding photos and I do love that particular part of England, looking towards Robin Hoods Bay the scenery is just stunning! 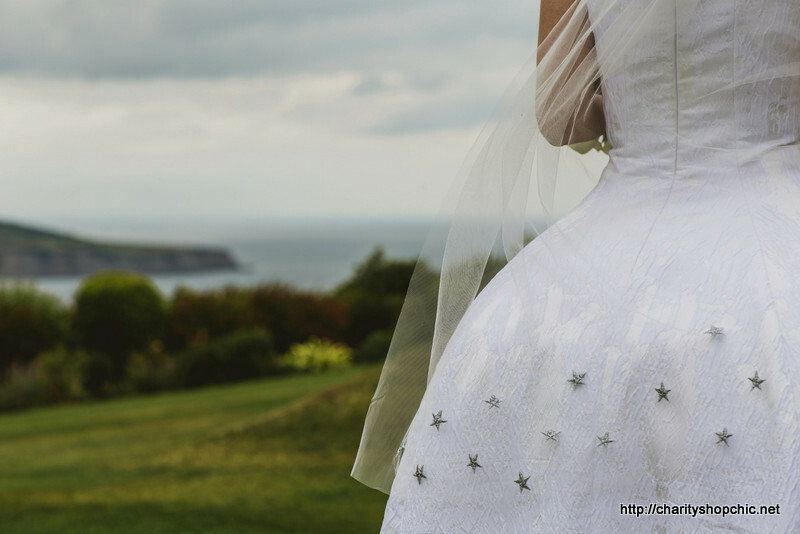 I’m amazed at the structure you’ve created in your dress, a feat of engineering, and it stood up well to those strong sea breezes, along with your gorgeous veil, it must have been well anchored! Hi Claire, thank you very much! Being local to that area I’m biased, but I do love it. It was pretty windy on the day but the dress stood up fairly well – my main worry was that the veil would blow off, but it didn’t! Thank you for sharing your sewing journey to the altar. The wedding photos are splendid, you made a beautiful, happy bride, and I found myself shedding a tear or two of joy, although we have never met! Bless you Ann, you are too kind! I’m glad you’ve enjoyed reading about it all. gorgeous, you are so lovely and talented, I think this dress is a triumph, wish you both every happiness. Thanks so much for your good wishes, Alison! Thank you Jo, we had a wonderful day and it’s a lovely memory! I loved reading all your wedding dress posts, you did a wonderful job! Congratulations for the dress and the wedding! Thank you for reading, Kellyac, I’m glad you’ve enjoyed it! Wow. Really wow. How long did it take you to make this incredible creation? You are stunning. And you make a beautiful couple. Congrats on an haute couture dress! (I ask how long it took you because mine took me about three months to make and it was nothing as amazing as yours, it was 1991 and the height of the Princess Di dress mania… I was planning a bias cut dress something like Carolyn Bessette later wore when she married John Kennedy, and the fiance got to know and sulked because he thought I should have a princess dress…. 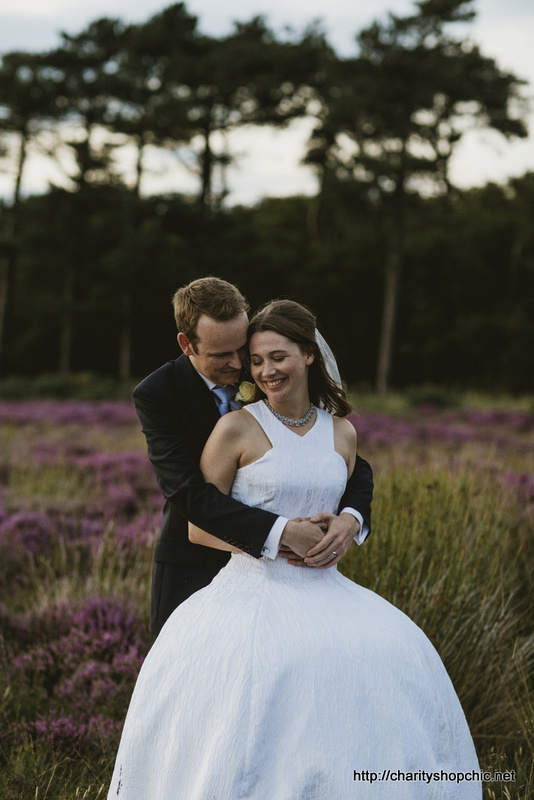 so I made one – bustier bodice, off the shoulder puffed sleeves, neckline edged with silk roses, huge puffy skirt and train with acres of petticoats – you get the drift… I should have known we weren’t meant for each other!) Anyway, that was relatively simple next to this. The underpinnings, the sculptural effect, the neckline – incredible work! You are a star of the sewing world:). 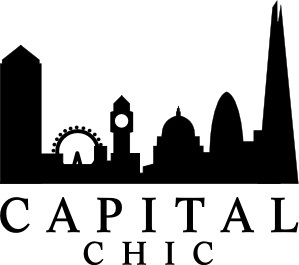 Hello francescapia, thank you for reading about my dress! It took about three months intense work to make this (evenings and weekends) plus a few weeks working on the veil and comb. Plus many months of research and design beforehand. Your dress sounds incredible, certainly a huge project! Thanks for your kind comments and good wishes! Yippeeee! So stunning and lovely! What a masterpiece!! Thank you for sharing–it brought a big smile to my face :-) Happy trails to both of you! 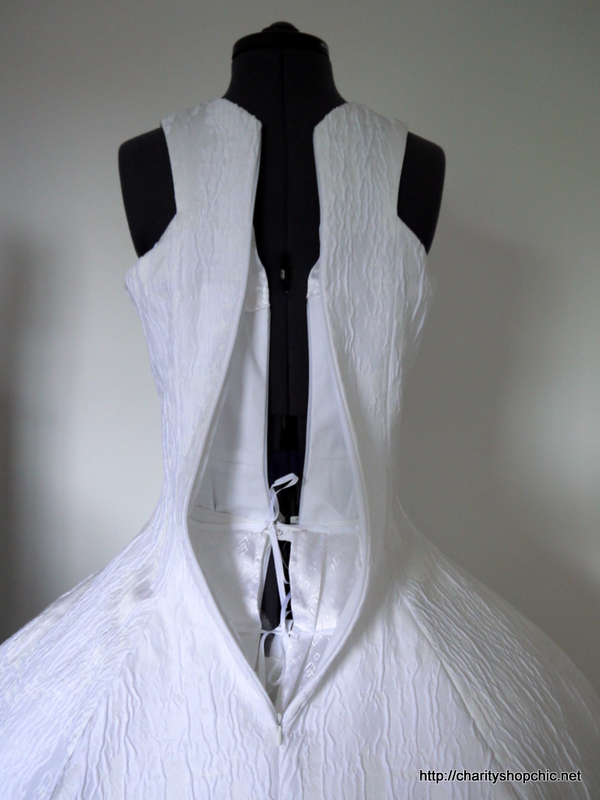 I’m in complete awe at the entire process/problem solving/sheer wonderfulness of this dress! Congratulations, what a wonderful memory to have! Thank you so much, Emily! It’s been a lot of work but I loved wearing it and we had a wonderful day! Congratulations – on both your dress and veil, which looked absolutely stunning – and your wedding. I loved following along as you worked on each step. Thank you for sharing your incredible journey with all of us. You did a fantastic job. You should be so proud of yourself and your fabulous achievement. Well done! Thank you so much for your good wishes, Heather! I’m so glad you enjoyed reading about the dress! What a lovely dress! You both look divine. Have a happy future together! What an amazing outfit, what an amazing story. Thank you so much for sharing. 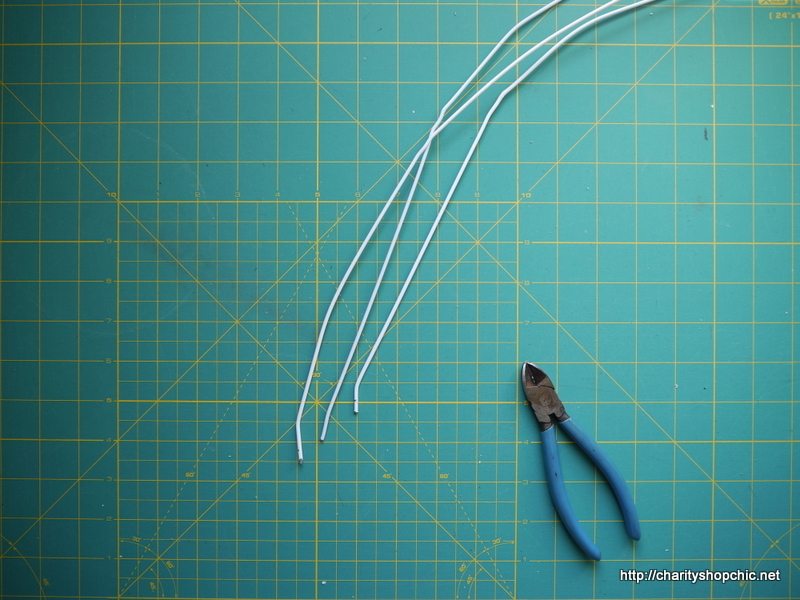 Thanks for reading – I had a great time making and wearing it! I just read through the 7 part wedding dress series. WOW! What a fabulous result! Today is my 29th wedding anniversary and in 1987, I made my own dress. I love that your shoes are pink! That’s the only thing I would have done differently. Wear colorful shoes!